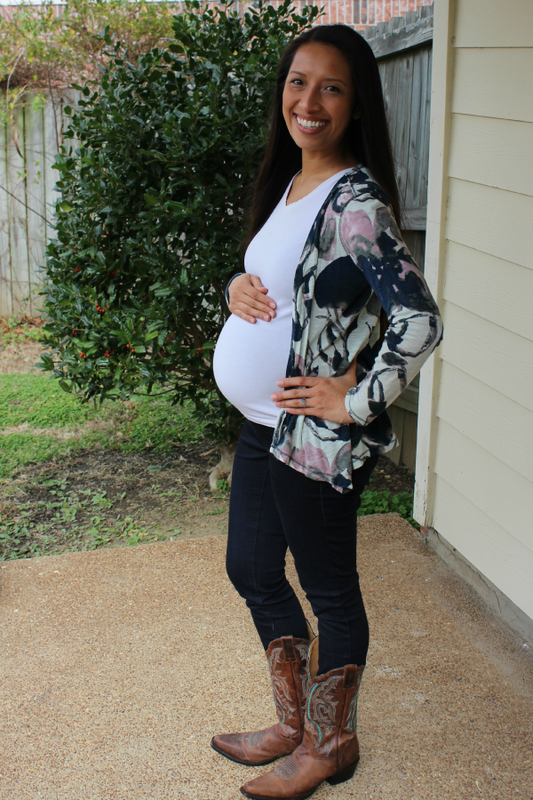 Taken on 11/30/2014 at 28 Weeks. Hello, third trimester! Wearing: Light, silky-like pajama pants and a white fitted tee, because nothing is more appropriate on a gloomy Sunday at home. Can't live without: My seamless cami bralettes from Walmart, of all places. They're identical to the Coobie bras but for under $5 each! I've worn wire-free bras for four years, because I find they're way more comfortable, and I'm lucky that my 32B bust doesn't require a whole lot of support. I still have a few regular bras for those outfits that call for some extra lift or a strapless look, but on a daily basis, I'm flying wire-free. Since getting pregnant, "the ladies" have become much fuller and sensitive. I'm all about comfort, and these seamless bras are everything. They're like sports bras but prettier and less constricting. I highly recommend them for my fellow small-busted friends, pregnant or not. Wondering: How in the world my body is going to handle the end of this pregnancy. She's over two pounds now, and she is strong and solid! There is always some part of her pushing outward and poking out. It's alien-like, and I love it. Loving: Every time my husband kisses the baby through my belly. Reading: Blogs, which I haven't done it weeks. It's nice to catch up with everyone! Loving: Being asked when I'm due during meetings with people whom I've never met, because I am very obviously pregnant now, no matter what I'm wearing. It's always happy conversation filled with well wishes. Looking forward to: Taking Wednesday off from work to go to Graceland (yay!) after doing my glucose tolerance test (boo!) and flying to San Diego next week for family time and our baby shower! Laughing at: My belly button which is having identity issues. Am I an innie? Am I flat? I don't know who I am anymore! You look fantastic. It's amazing how the time is flying by. What a crazy miracle this all is. I'm so happy for you! I can't believe you're already on the last leg. I took note about the bras, too. Thanks! You look great and so glad you're feeling good. I'm looking into the bras you suggested! My belly button is totally weird now too...definitely still an innie...but I've never seen the bottom of it so up close and personal.